Often, spas look at retail as a secondary tier to their business and therefore do not give it the time and attention that it deserves. Making some minor and possibly major adjustments to your retail space can increase your bottom line. Full-service salons, day spas, medical spas, holistic wellness centers, hotel and destination spas were surveyed. More than half of the respondents generated less than $400,000 in annual gross revenues while 25% reported sales volumes over the one million dollar mark. Almost 60% of the respondents had a retail-to-service sales revenue of 15% or less, while 35% had retail sales revenues of greater than 15%. Take a good look around. Are you fully utilizing the space to the best of its ability? Ask staff for their input and ideas. You may be surprised by what you learn. Designate a retail specialist, an employee whose sole purpose is attending to retail. Their job is to monitor, stock and merchandise on a daily and weekly basis and write orders. They are also highly trained and educated on all products and can help clients with their purchases. Organize the retail space so its easy to navigate. Group lines together and create a feature product area for items that you may be promoting. A feature area should be inviting and interest clients to stop, test, smell and try a product. Brands that have the best eye appeal/packaging should be placed in the most visible area. Cleanliness and neatness are a must. Have a ZERO dust policy. All retail spaces should be eye level, at least 2 ft off the floor and no higher than 5 feet. Think of Sephora for example, all products are mainly eye level and in reach. Clients should not have to bend down or reach too high. Pass on manufacturers displays if they do not work for your space. Create retail opportunities within your space. Use hand cremes in the restrooms, have special feature vignette in key spaces: client relaxation areas, waiting areas, drying stations and treatment rooms. Signage is key. You can have product price lists, event information and specials displayed within your merchandised space. Vendors are your partners. If you feel stuck, have your brand representatives come in and help with merchandising. Additionally if you have items that are not selling at all, switch them out, or schedule more product education and training. Stay Current. When is the last time you introduced a new product or brand? Is your retail platform looking a bit dull? Just like wearing the same thing every day, clients and staff need to try and use new products. Don’t get stuck and try something new. 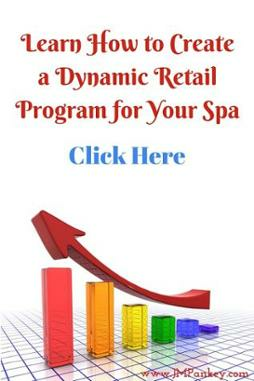 View your spa retail as a whole and analyze your staff, brands and retail space. It is a multi-dimensional area, where your clients, staff and product intersect. Make your retail space the best it can be and increased profits will follow. If you don’t know where to begin, schedule a call with JMPankey Partners to get a leg up.